Used during WWI, this German made 77mm breech loading gun has wooden wheels with iron tires, hubs, and tracking rings bolted to the spokes. The gun was in poor and unstable condition when The PA Military Museum contracted B.R. Howard to provide conservation services. Much of the piece had areas of rust through, corrosion, patched areas, and weak or disfigured areas. The wooden wheels were in poor and unstable condition. Several spokes were cut and had inserts added; others had areas of fungal decay and were weakened by cubical brown rot causing failure. The piece was partially disassembled to facilitate treatment. All wooden wheel components were replicated using white ash. All metal wheel components were cleaned to remove excess paint and corrosion using an air abrasive cabinet charged with glass beads. The wheels were primed and re-assembled using both original and replicated metal components. 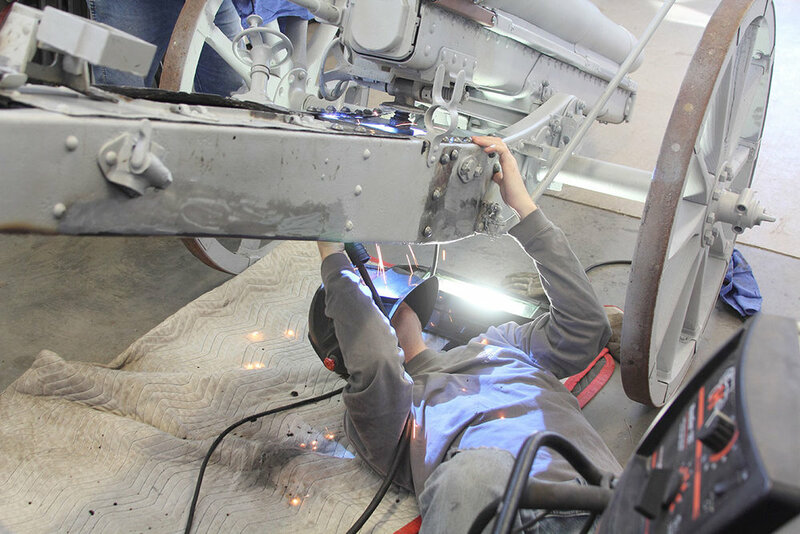 The old metal “patches” and welded repairs were removed using grinding wheels and a plasma cutter. Areas of “rust through” were cut out; these areas were then filled with mild steel welded in position with a MIG welder. The filled areas were finished with electric grinding wheels fitted with abrasive discs. The steel cross sections and bracing were replicated and installed between the rails. The steel sections were secured using both original hardware and modern mild steel dome headed rivets. The partially disassembled artillery piece was chemically stripped to remove the multiple layers of over paint using a methylene chloride based gel. Revealed corrosion was reduced using an air abrasion unit charged with glass beads. The metal was then cleaned and primed along with the new wooden inserts.